I attended an event held by EQUAL UA. You may have seen their yard signs around town—EQUAL Together We Are Better. EQUAL UA is an organization with the goal of fostering a welcoming and tolerant community. A place where differences can be celebrated and appreciate rather than ignored or assimilated. Two brave young (especially when compared to me) black men raising their families in UA spoke about their experiences in our community. They both spoke of racist encounters right here in UA. They then went on to discuss an incident involving a young black boy who was stopped by the police for suspicious activity in UA back in July. The suspicious activity—delivering newspapers. I was embarrassed as they described these incidents that not only had they occurred in the community I call home, but that I wasn’t even aware that any of it had occurred. The young men described why they chose to live in UA. Their answers weren’t very different than my own—Great schools, beautiful parks and homes, and safe neighborhoods in which to raise their families. I have always been fascinated by intersection of sports, race and politics. I know for many sports is a place to escape and just appreciate athleticism or root zealously for their team. Perhaps for them “Shut Up and Dribble” resonates. For me, the athletes I admire the most—those closest to being heroes have walked that tightrope. For me, no one has stood taller than Arthur Ashe. I grew up playing tennis and truth be told Ashe’s prime was already behind him by the time I began paying attention to tennis players like McEnroe, Borg, Connors and Lendl. But Ashe was still sort of around most notably as Davis Cup captain for the USA team. And also as an activist; an early voice denouncing apartheid in South Africa. Beyond that Arthur Ashe was super cool. Sort of Obama before Obama. As Davis Cup captain, his attempts to reign in the volatile behavior of McEnroe (always) and Connors (on the few occasions he was willing to play for his country) were a struggle. But with Ashe it was clear winning wasn’t everything; how you played the game, how you represented your country were equally if not more important than the outcome. That is why what happened in the Women’s US Open final, played on Arthur Ashe Stadium Court was all the more remarkable. Serena Williams was attempting to win another grand slam title, her first since taking time off to become a mother. Her opponent, Naomi Osaka, was seeking her first grand slam title at the age of twenty. I had seen enough of Osaka’s play earlier in the tournament to know this had the chance to be a really competitive match. The young Osaka was the better tennis player that day, but unfortunately the match won’t be remembered for the outstanding tennis. It will be remembered instead by the controversy between Serena and the umpire of the match. By the time the match ended, Serena had been imposed with three conduct penalties the last of which included a one game penalty that all but sealed the match for Osaka. But on this day, Serena was no champion (or was she a champion of some bigger cause?). Her behavior closer resembled McEnroe than it did Ashe. And that seemed part of Serena’s frustration—that she was being treated differently because she is a woman. What went unsaid was that perhaps she was being treated differently because she is a black woman. Although the initial conduct penalty was for coaching which in her mind branded her a cheater. The penalty stemmed from her coach’s actions, who admitted the infraction and so if anyone was cheating it was him, but that may be splitting hairs. Her frustration mounted as the match continued. Osaka had an answer for every shot Serena threw at her. Eventually causing Serena to smash her racquet after losing her service game for which she earned her second conduct penalty. As the next game began, Osaka began the game already leading 15-0. Serena was surprised to be assessed a penalty point as perhaps she believed the umpire had rescinded the initial conduct penalty for coaching, but he had not. Serena’s frustration grew as her composure deteriorated. The third conduct penalty was assessed after Serena called the umpire a thief. Serena believed the umpire had stolen a point from her when assessing the second conduct penalty (mostly because she didn’t think she deserved the first conduct penalty). Serena was shocked that her “tame” outburst caused a third conduct penalty and with it an automatic one game penalty. So instead of being down a set and 4-3 in the second set she was now down 5-3 and Osaka needed just one more game to win the match. Remarkably, Serena regained her composure to hold her serve to make it 5-4. More remarkably, the young Osaka calmly held her serve one last time and she was US Open Champion. The two champions met at the net as the crowd booed—this was no way to celebrate your first Grand Slam title. A feat all the more impressive because of who she beat. In her mind, Serena wasn’t just standing up for herself, but all women, and as a new mother for her daughter. It was if she wanted to create a record that her daughter could look back to and see her mother didn’t just accept injustice, but stood up and fought it. And I think that is worth admiring—we should all be doing more of that in our lives when we see it. Not too long ago I was in the check out line at the grocery. The man in front was holding a plastic bag with groceries in it and was just buying one item which he indicated he had forgotten to buy when he checked out previously. The cashier asked to see his receipt for the items he already bought indicating it was the store policy to do so. The man walked out without buying that additional item. He was a black man. I wish I had walked out with him. Or at least asked the cashier if she would have done the same to me. Even if she had said yes, at least I would have made her think about it. Instead, I rationalized that I had spent the last hour picking out all these groceries and I didn’t want to start over somewhere else. I checked out, paid my bill and walked out without saying a word. I failed my community that day. Standing up (or kneeling) for injustice can be inconvenient and uncomfortable. I guess that is why I admire it so much when I see others taking on these burdens. The moderator of the EQUAL UA event reminded the mostly white audience that we too have obstacles in our lives we have to overcome, but those obstacles don’t exist because we are white. People of color face obstacles in ways its hard for me to conceptualize, but on those rare occasions when I am confronted with it, I need to do better, I need to take a stand or say something. I hope next time I won’t just Shut Up and Dribble. Serena’s behavior over-shadowed what should have been a celebration of women’s tennis and the rise of a new, deserving champion. Serena’s behavior also has led many to consider or reconsider the double standards that exist for woman and people of color as athletes and more broadly in our society. Perhaps there is a lesson for our local community as we reconcile the history of UA with the goals of groups like EQUAL UA to make UA a more tolerant and welcoming place. A worthy endeavor indeed. In the last week I’ve come across the expression “our country is being torn apart” many times and phrased many different ways. I thought since this is National Coffee Day and I myself own a small coffee shop, I would chime in briefly on why I still am hopeful about the USA. Every morning at Colin’s Coffee in Upper Arlington, OH, a group of regulars loosely assembles around our coffee bar to figure out the world’s problems, talk sports and sip on something caffeinated. This group of folks consists of people all over the political spectrum. Left, right, moderate, crazy… you will hear it all and react as such. As you might imagine, during a week such as the Kavanaugh hearings (or a Buckeye football loss) emotions can run high and the debates can get a little heated. But you know what, that next day, the same folks come back and a new discussion begins a anew. Because here is a little secret for everybody: You can be friends with many people AND have differing opinions about politics. In fact, isn’t that a major premise our country is founded on? So you can choose to drink your coffee while ranting on Facebook or sitting in the drive thru listening to talk radio tell you how wrong EVERYBODY else is..
Or you can walk into a local coffee shop, meet some of your neighbors face to face and realize that even though you disagree over some ideas, there are many other topics you can agree on. Most folks are pretty good people once you get to know them. After all, it’s not really the coffee that matters, it’s who you are drinking it with. Colin Gawel owns Colin’s Coffee and plays in the band Watershed. He founded Pencilstorm and his favorite band is Cheap Trick. The crowing Rooster woke me in North Central Nebraska. The Rooster said it was time to head home. After 16 days on the road, our adventures were winding down. We had a leisurely day planned for our last full day away from home, planning to see a few historical sites and take our time heading East. The primary destination for this day was Homestead National Monument of America. Homestead National Monument is located near the town of Beatrice (pronunced Be-AT-ris), Nebraska, about an hour south of Lincoln. It memorializes the Homestead Act, enacted by the United States Government to encourage settlement in the West. Free land was given away with the stipulation that the land would be "homesteaded"...worked, developed, and farmed. The site exists as a memorial and a tribute to those hardscrabble adventurers and dreamers who paved the way to the West for the rest of us. We began the day in Lincoln with lunch and beers at Nebraska's oldest brew pub. The University District was relatively quiet and relaxed for a Saturday. We were one week early for the college football season, but as residents of a Big Ten college town ourselves, we knew the place would be hopping in a week's time. After our repast we drove South to Homestead and spent the afternoon walking through the meadows and pathways, and checking out the preserved dwellings there. We then drove on to Council Bluffs, Iowa, where we met an old friend of mine for dinner and more beers (you might have noticed through the course of this series that we enjoy a good brewski). Our intention then was to drive through the night, arriving home in Ohio in the early morning. But we woke up at a rest area on I-80 in eastern Iowa at around the time we had planned to be home. I had dozed off immediately after hitting the road, and Heather had grown drowzy as well so she had pulled in for a few Z's and slept through the night. We were under no pressure to be home at that time, but now we had a much lengthier stretch still to travel. 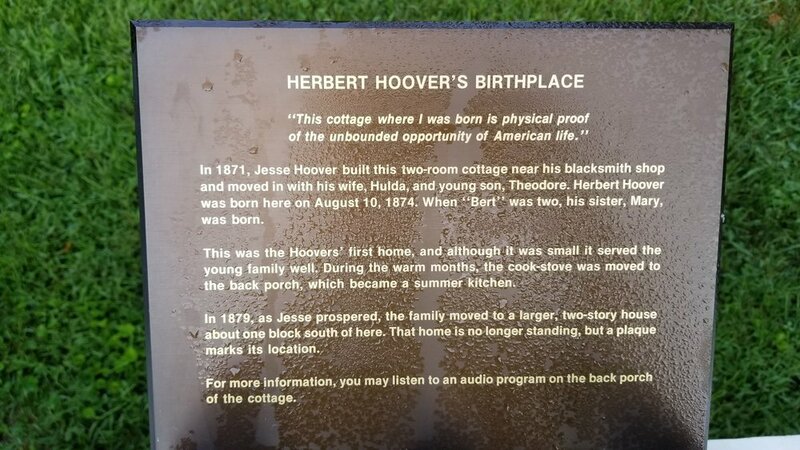 Making the most of our now 8-hour delay, we pulled off the highway again in West Branch, Iowa to visit the Herbert Hoover National Historic Site, which preserves the birthplace, childhood neighborhood, and resting place of The 31st President of The United States, as well as being the location of his Presidential Library and Museum. We were about an hour early for the opening of the visitor center, so we strolled around the quiet streets and drove to the Presidential gravesite. We got back to the center just as they were unlocking the doors and stamped our last cancellations for the trip. 8 hours later we were back home in Ohio. 7,219 miles, $565.55 in gasoline costs, 12 National Park sites visited, 9 hours of Rock And Roll and 97 songs later, we were finally home and sleeping in our own bed. Another adventure in the books, and a liftetime of memories made. And of course, I am already making plans for The Great American Roadtrip 2019. Always remember one thing. The journey IS the destination. Click here for previous Pearl Jam Road Trip . 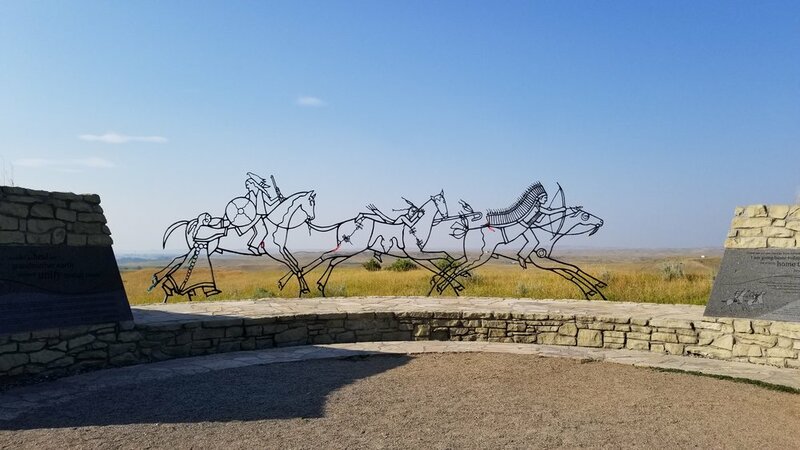 After our previous day at Little Bighorn, we had driven back through Sheridan, Wyoming in search of camping (keen readers take note...we had come full circle), but darkness falls quick in the mountains after sunset, and we had once again let time get away from us. So we drove back into town where we had phone service, and I pulled up my Hotels-dot-com app to look for a vacancy. I was pleasantly surprised to see that I had a free night's stay coming. So we booked a room near Gillette, one hour away, and close to the next day's destination, Devils Tower National Monument. Devils Tower was the first United States National Monument, established by President Theodore Roosevelt in 1906. It sits in the Black Hills region of eastern Wyoming, near the border with South Dakota. Any trip to the Badlands or Mount Rushmore area should include some time at the Bear's Lodge (as it is known to Native American tribes in the region). Made even more famous by the Steven Spielberg film Close Encounters Of The Third Kind (still screened nightly at the Devils Tower KOA campground), the tourism industry here has maintained a steady uptick for the last 40 years. 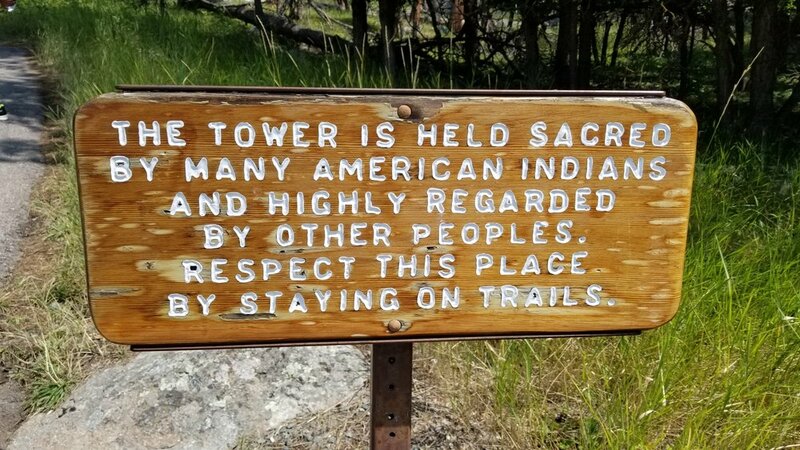 We had visited DTNM twice before, and both times we had taken the shorter paved walkway that circles the base of the monolith, about a mile and a half in distance and a relatively easy walk. On this our third visit, our third encounter so to speak, we decided to take the three-mile Red Beds Trail, which roughly follows the perimeter of the park site through varied terrain, descending to a canyon of red bedrock (hence the trail name) before the steady ascent back to the tower. It was fairly strenuous hike on a 90 degree day (we ran through all the water in our camelbacks as well as the extra two bottles we carried), but we were rewarded for our efforts with stunning views of the Belle Fourche River flowing through the valley below us and the tower's ever changing profile above. After our hike we drove a scenic backroad into South Dakota. We stopped at an abandoned coal mine near the state line for some photos, and attempted to visit the Old West town of Deadwood, but there is only one road in and out of town and there was a parade going on which was forcing three-hour delays. So we turned around, returned to Interstate 90, and drove on to Hill City, SD where we were lucky enough to snag the very last room at the Super 8 Motel there. After checking in and enjoying a soak in the hot tub, we drove the 12 miles to Mount Rushmore National Monument. Travel tip: go to Mount Rushmore at night. It's open until 11:00 PM, and you can even get your NPS passport stamp in the visitor center until 10:00 PM. There wasn't anyone collecting the $11 parking fee (which is good for the calendar year so it's actually a good deal), so we skated on that. And best of all, we practically had the place to ourselves. There were just a few other people there, and they were being quiet and respectful. My previous visits to Mount Rushmore were always during the day, but seeing it lit up at night was truly awe-inspiring. The next day we visited nearby Jewel Cave National Monument and Wind Cave National Park for stamp cancellations. We were over an hour early for the next tour of Jewel Cave, which is the longest cave system in the United States and one of the longest on Earth. Unfortunately for us, it is a two-hour walk through and we didn't have three hours to spare. A cave tour would have to wait for a future visit. At Wind Cave there weren't any tours operating because the elevator was on the fritz. We looked at our trusty Rand McNally Road Atlas and saw there was a dirt road which led from the Wind Cave area into Badlands National Park, our next destination. As big fans of the backroads, this was a no-brainer of a route. The initial part of the road was through ranching and farming areas, but about thirty miles into the drive we came to the town of Buffalo Gap. It was a decent size little village with not one, but two bars. One was called The Water Hole, and it was in a large log cabin style trading post building. There was a dry-erase sandwich board in front that advertised $1.50 hot dogs. A large banner informed us of "Live Music Every Friday Night", and another welcomed bikers (the world famous Sturgis Motorcycle Rally had just ended the previous weekend). The other drinking establishment in the tiny hamlet was in a steel building literally on the edge of town, with a hand-written sign in the window that said "Last Chance Saloon". Thinking a couple hot dogs and a beer sounded good, we returned to The Water Hole. There were a few other cars in the small parking lot, and the place looked open, so we stepped inside. The scene that greeted us was like a verse from the Charlie Daniels Band song "Uneasy Rider". Most of the lights in the place were turned off, and there was no one working behind the bar. At a table sat three men and two women, all with open beers in front of them. One man resembled Uncle Si from Duck Dynasty, the other two looked like Larry The Cable Guy's more fit brothers. Dead silence filled the air as they just stared at us. "Um," I spoke up, "That hot dog special looked pretty good." After a few seconds that seemed like minutes I managed to spit out some more words. "Well, looked like a cool place you have here so we thought we would stop in and check it out. Have a good day." We took a quick look around at the stage with amps, drums, and guitars already set up (this could have been the band hanging out before their Friday night gig I reasoned), and then beat a path back to the door and moseyed on out of Buffalo Gap. I had flashes of horror movies that started like this. After that strange interaction, the remainder of the drive East was gorgeous as we approached the strange hoodoos and bluffs of The Badlands. We were visiting The Stronghold Unit, which is a largely undeveloped area of the park that sits on the Pine Ridge Indian Reservation. We stopped and got our stamp at the White River Visitor Center, then drove a seven-mile gravel road to the top of Sheep Mountain Table, a large plateau that dominates that part of the park. We were greeted with stunning panoramic views of the surrounding wilderness. It was getting late into the day and we still were trying to at least make it back to the Central Time Zone before we bedded down (saving ourselves an hour of clock time the next day), so we continued South through Pine Ridge before stopping at the Wounded Knee Massacre site, where shortly following the Battle of Little Bighorn, Sioux chief Bigfoot and 200 others...mostly women and children, were gunned down by the U.S. 7th Cavalry and buried in a mass grave. While I was reading the historical marker, a Sioux Indian man pulled up in his pickup truck. "Is it oldies day out?" he said with a grin. "You guys like arts and crafts?" He looked at Heather and added, "Are you Native? You look like an Indian." Heather, being quick on her toes replied "I don't know." She wasn't lying. She is adopted and honestly doesn't know her exact heritage. After a little more chit chat, he pulled out his tub of wares. All of the necklaces he was selling were more than I had cash on hand to buy, but he had a couple of small dragonflies woven from Prairie Sweetgrass that he only wanted $5 for both of them. He gave us his pitch, "These ward off negativity. Put them on a string and wear them around your neck". They were neat little souvenirs, so I bought them from him and we drove on into Nebraska to find a campground for the night. Mount Rainier is the largest active volcano on the west coast of the United States, and one of the largest mountains in North America. On clear days it dominates the eastern sky of Seattle and it has become a living symbol of the Pacific Northwest. MRNP is our fifth national park, established by President William McKinley in 1899, and it was the first national park created from a national forest. We had visited the park once before, but it had been sixteen years since we were last there. So we made sure to include some time on the mountain in our itinerary for this trip. Due to time constraints, we had to decide on one area of the park to focus on. 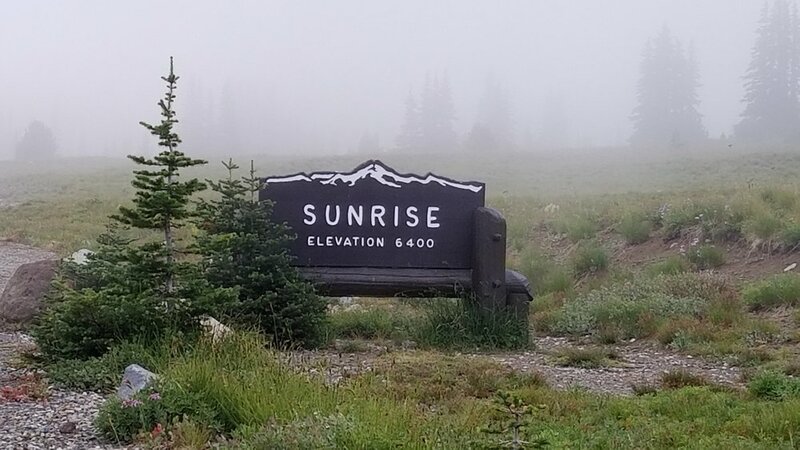 We were approaching from the east, so we decided to head to Sunrise, which is the highest point on the mountain reachable by car. Mount Rainier makes its own weather, and a common saying in the Pacific Northwest is "I hope the mountain comes out today", which refers to the fact that the volcano can often be shrouded in clouds and fog. Unfortunately for us it had decided to hide itself away on this day. We reached Sunrise and while it initially seemed that the fog may burn away, it never happened. We wouldn't set eyes on the great fire mountain until the next morning, from fifty miles away, when we left our campground in the National Forest and were greeted by a panoramic view of both Rainier and its infamous southern neighbor Mount Saint Helens, which last erupted in 1981 (the effects of which are still visible in the area). Not far into the morning drive we passed a large tent city, which called to mind the homeless camps back in Seattle. These tents, however, temporarily housed firefighters from all over the United States who had come to battle the epidemic of wildfires currently burning all over the West. I said a few prayers for these brave men and women, heroes all. The rest of the day's seven-hour drive was filled with gorgeous scenery that passed by our windshield at a steady clip. We passed through Yakima Canyon, The Columbia River Gorge, and the breathtaking Northern Idaho Range. By early evening we had reached Missoula. We got checked in to our motel and took a drive through town to scope out the stadium area and assess potential parking spaces for the next day. It became immediately apparent that Pearl Jam fans had invaded this small college town. Once again we saw a tent city, this time it was the diehards camping out for the next morning's GA line. We drove back out to the Interstate and had dinner at a chain restaurant (gift card) and then back to the room to crash. We awoke on show day to terrible news. Glacier National Park, where we had planned to spend the next few days, was on fire. The popular Going To The Sun Road (a high mountain road...you know I love those) was completely closed on the west side of the park. We knew our plans would be changing. We tried to take our minds off of the tragedy by heading to the brewery next door to the motel, but the lines for service were long, due to the number of fans in town. So instead we bought some beer at the Conoco station across the street and drove to the University District to tailgate before the show. 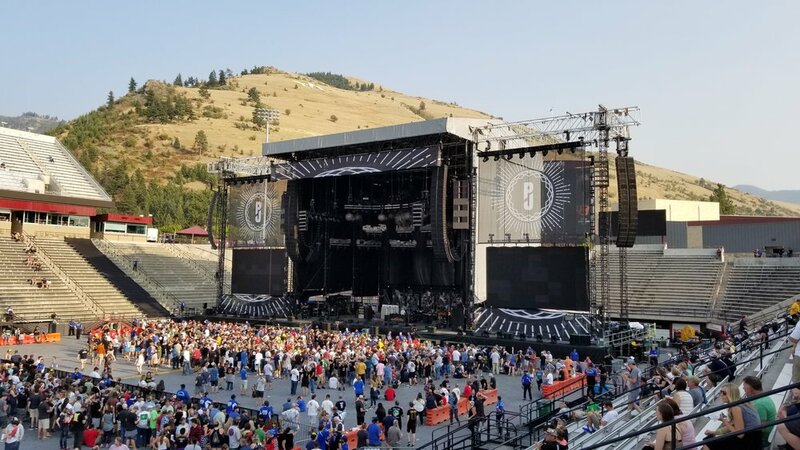 The concert this evening was also doubling as a benefit fundraiser for Montana Senator John Tester (bassist Jeff Ament grew up in and still maintains a residence in the state, and is active in Democratic politics there). The band had arranged for a Rock-The-Vote rally to be held outside the stadium during the afternoon. We watched a few of the local bands, grabbed a few beers, and got in line for the 10 Club Pit. The end of the line stretched all the way around the stadium, so we were pleasantly surprised once we got inside to still get a spot on the rail in front of Mike McCready's side of the stage. We made friends with our new neighbors and settled in to await showtime. The band hit the stage a little before 8:30 PM, with Vedder sporting a snappy Evel Knievel style leather jacket in tribute to the legendery Montana daredevil. This concert was a bit more subdued than most Pearl Jam shows, due to the political nature of the event, but they still delivered a lengthy set featuring some rare tracks that hadn't been played in a long while ("Songs for the serious collector" as Eddie would say). They stressed the importance of the upcoming election, and Vedder said he hoped that Montana could set the record for youth voting. I wasn't interested in the politics...I often disagree with the band's stances and I can't vote in Montana anyway. I was just there for the tunes. There was also a touching moment where Jeff's parents came onstage to congratulate him. In the end, it was another transcendent show, and in a gorgeous setting to boot. And that's all it needed to be. As the night wound down I wished that we could see more shows on this tour, but our concert chips had all been cashed in. At least we had the rest of the week ahead to visit more stunning locales. That should ease the post-show withdrawals a bit.